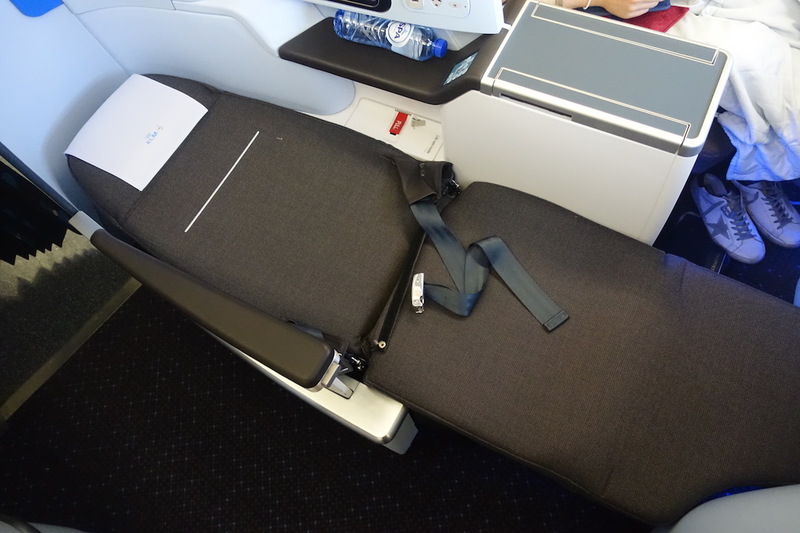 In this post I wanted to share my initial impressions of KLM’s A330 business class. KLM just recently finished reconfiguring all of their A330s with flat beds, with the last plane having been reconfigured last month. 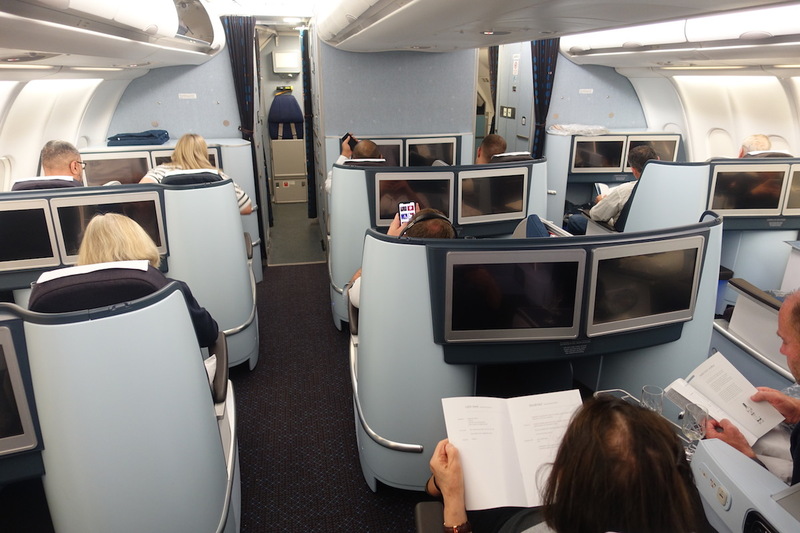 KLM’s A330 business class consists of a total of 18 seats, spread across three rows in a 2-2-2 configuration. KLM has B/E Aerospace Diamond seats, which aren’t the most spacious seats out there, though I don’t mind them when traveling with someone, especially if it’s not too long. I do think KLM did a very good job with the finishes — I like the colors, and I like that there’s a privacy shield between seats. Each seat has a large personal television, and generally the major downside to this configuration is that the footwell is quite small, so most people will need to bend their knees a bit to get comfortable (which is fine for me, since that’s how I naturally sleep). In bed mode the seat is certainly on the narrow side, though for a seven hour flight leaving at 2AM, it was more than sufficient, and I got nearly four hours of solid sleep. While perhaps not everyone appreciates this as much as I do, I like that each seat has an individual air nozzle. As mentioned above, this seven hour flight left around 2AM and landed around 6AM, so with that in mind, I thought KLM’s meal service was extremely well thought out. After takeoff there was a substantial snack service, which I’d say was more like a light dinner. Everyone got starters of hummus, tabouleh, and a feta and cheese eggplant wrap. Then there were two choices of mains, including fish masala with biryani rice, or beef kibbeh and a vegetable fatayer. Then there was tiramisu for dessert. This was served really quickly on a single tray, and less than an hour after takeoff the service was finished. 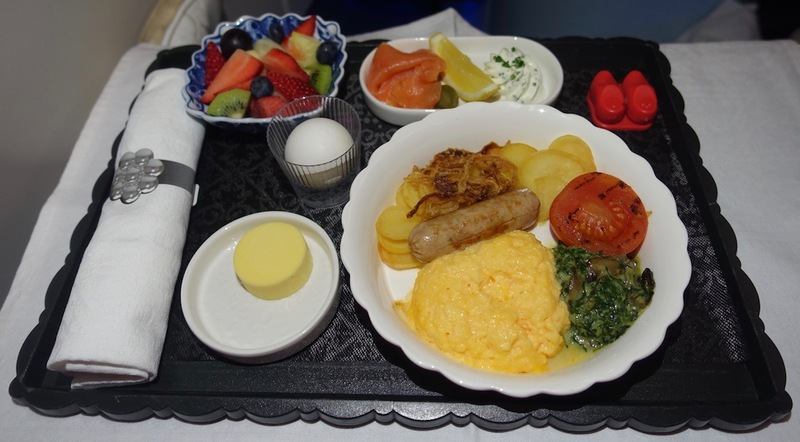 Then just over 90 minutes before landing breakfast was served, which included a choice of an omelet, waffles, or yogurt and granola. That was accompanied by fresh fruit and smoked salmon. The quality of the food was excellent, and on top of that I love the dishes they use, the clog-themed salt & pepper shakers, etc. As far as amenities go, KLM offers some pretty average pillows and blankets in business class. 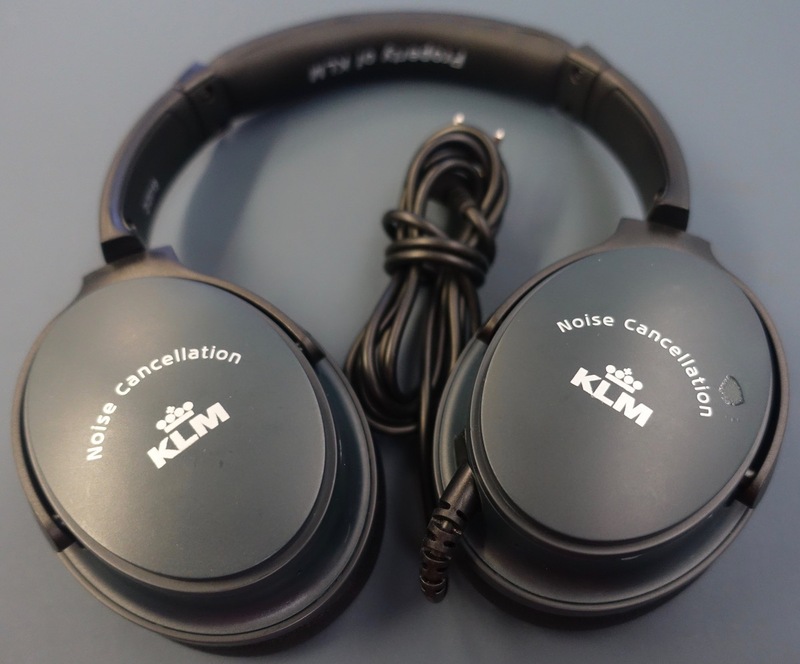 Then there are noise canceling headphones, which are among the better ones out there (they’re not Bose quality, but are better than the garbage ones that Delta has, for example). For amenity kits you have the choice of two kits, which have the same contents. While the KLM A330 doesn’t have wifi, it does have an excellent entertainment selection. Not only is there a good selection of movies and TV shows, but the system is also extremely responsive and easy to use, and there are no ads. 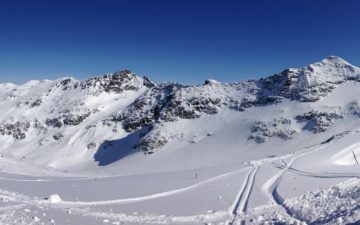 For the most part I find that KLM has very good service. During boarding the captain came around and greeted every business class passenger, which was a nice touch. The purser was also a really nice guy. Then there were two other flight attendants working business class. One was extremely friendly, while the other seemed really friendly at times, and seemed to have an attitude at other times, which I found odd. Still, overall I was impressed by the speed and accuracy with which they performed the service. For the most part they were also really nice. 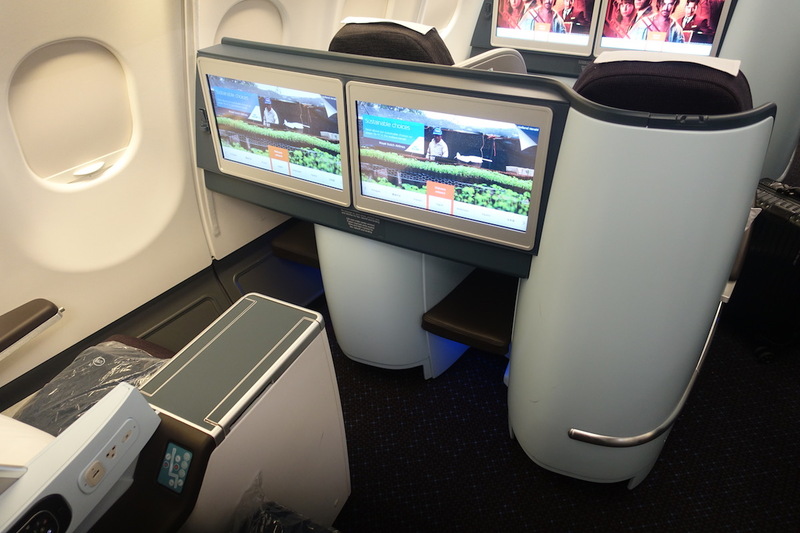 While not a cutting edge hard product, we had an excellent flight in KLM’s A330 business class on this short flight. I managed to get almost four hours of sleep, which is pretty good. 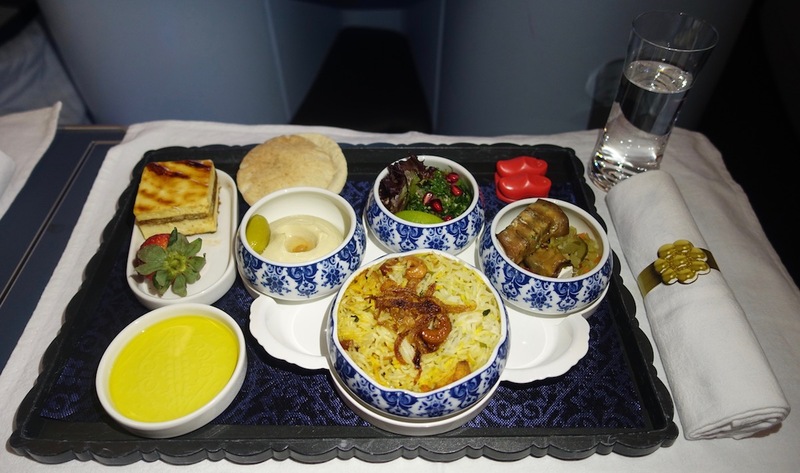 The food was excellent, the entertainment selection was good, and I love KLM’s china and other amenities. 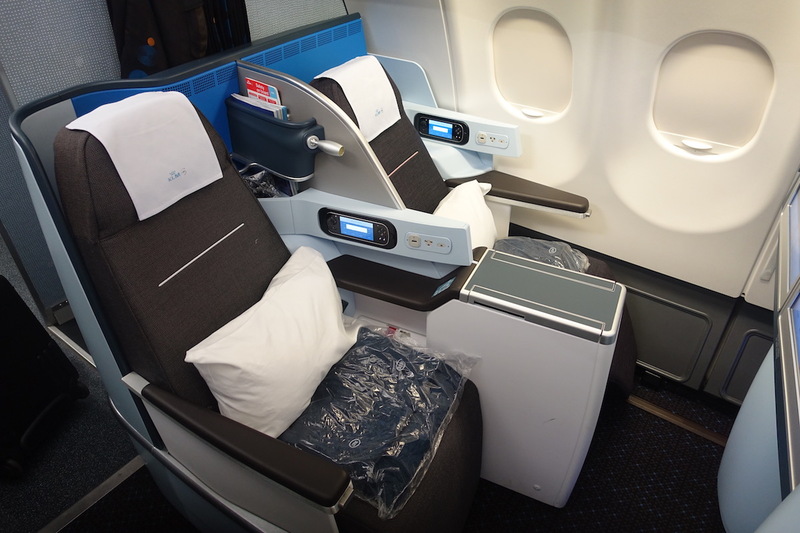 If you’ve flown KLM’s A330 business class, what was your experience like? I flew onboard a refurbished KLM A330 a few weeks ago, from Amsterdam to Rwanda. Seats are ok, a bit cramp, not the best in the skies, but I do love KLM’s enthusiast cabin crew, the little design touches (e.g. 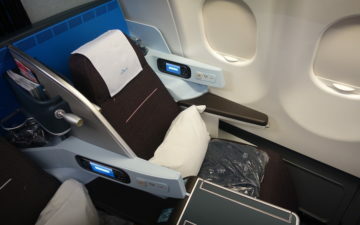 tableware, etc …), and the little Dutch houses as a gift (I made a trip report with Youtube clip: https://theluxurytravelexpert.com/2019/02/06/review-klm-a330-business-class/). Btw, I noticed on your blog that you recently spent one night in Kigali as part of a trip to cover Rwandair’s Business Class. You should return to Rwanda soon and stay a little longer, since the country is magnificent and some great hotels have opened there in the past years (Bisate Lodge, One&Only Nyungwe House). pretty crazy that they are still hading out the little houses. My dad used to bring them back home when I was a kid…30 years ago. My husband and I flew KLM Business Class IAD to AMS in mid-December. The flight was delightful and was made so by the crew. Although we are both tall, we had no problem with the seats when put in bed mode. The food was airline food and the wine selection was somewhat lacking; however the efficiency,friendliness and enthusiasm of the crew more than made up for this. Never had a lousy experience on KLM and did have a few great ones. I love the KLM seats. I sleep best on KL and TK seats. They are not fancy for the eyes, but precisely what I need to have a good solid sleep. And I really like the no nonsense approach on board. No lenghty unnecessary broadcasts, no unnecessary switching on safety belt signs at the first hint of turbulence. And not sure if you have noticed by typically KLM is taxiing at much higher speeds than anyone else. It always annoys me the ultra slow speed with which SQ planes creep to the gate. I am glad you love the little KLM houses but in this article and the other you wrote, you failed to mention they are filled with BLO Dutch Genever, the national liquor of both the Netherlands and Belgium. I love the KLM crews and on one flight, J class flight attendant even went so far as to empty the Genever out and wash out the little house as a muslim passenger wanted it but could not touch the alcohol. I think she went beyond the call of duty. 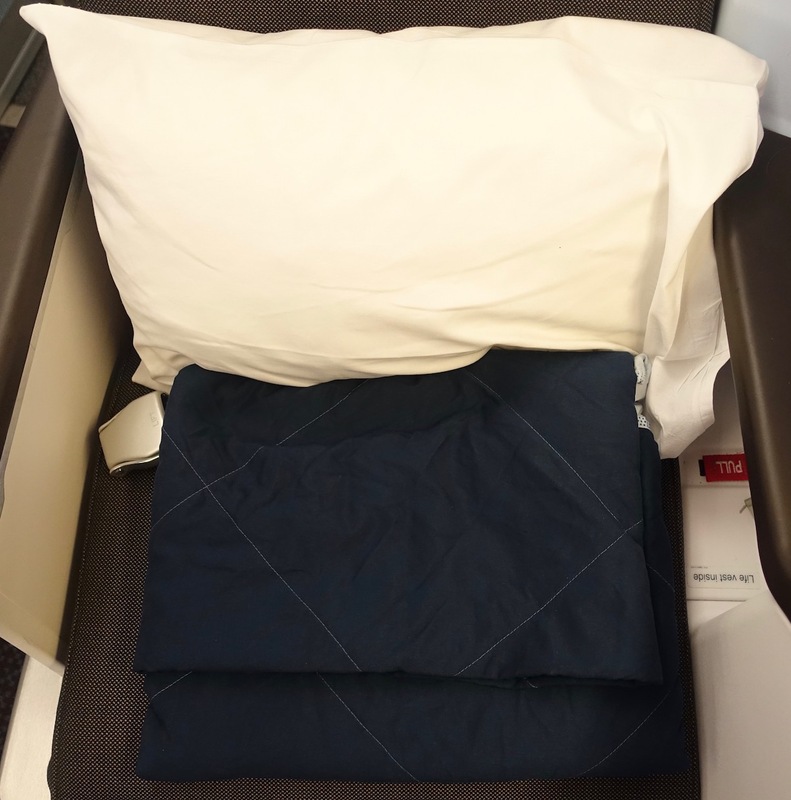 The 777 Business Class service between AMS and Vancouver doesn’t have house shaped chocolate or Dutch house wallpaper in the loo as of last July, so at least the wallpaper must be part of their upgrading of the AirBus interiors which were the last in the fleet to be done in 2018 and KLM has chosen are different design from the 777. Also the lounge in AMS, as someone else pointed out, is also newly renovated as of last December and before that I never got stroopwafels so I will now look forward to on this year’s trip and the new design. I love the quirkiness of KLM like you do and I love the cutlery and dinnerware designs as well. I always find that if you are nice to the flight attendants, tell them how much you like their country or airline, try to speak their language, even though they know you can’t, you will usually always be treated well. My multiple experiences of KLM J from SFO to Manchester(UK) have all been good. Not the cheapest option but consistent with good service,food,seats,staff,sleep. Currently TK are pricing $500 – $600 lower in J but with longer connection times. They are a good airline too. I love flying KLM (usually SFO-AMS) and love the little houses! The liquor is still intact in our collection to date; we fly them again in the fall. Flying Blue (AF/KLM) has been good for us in getting biz class tix with miles. One musn’t forget that the houses are filled with gin!! Interesting, the seats look quite a bit customized from the standard Diamond seats. It also seems that the center seats are arranged as V (like on Lufthansa) instead of parallel arrangement like normally with Diamond seats? Dinner looks dreadful. Who wants fish masala at 3am? Breakfast looked good and the other two options would have appealed. These seats are definitey a slogjt upgrade to their other Diamond seats (like the ones on the 777-200). Slight upgrade, I meant to type.